More info:2019 guide price pp sharing from: Jan-April £2970. May-Aug £2865. For prices after this, please ask. Please note holidays such as Easter attract a supplement on the above prices. Flights cost from £600-£1000 depending on time of year and airline. On this Costa Rica wildlife holiday, you will journey in two weeks across Costa Rica from the Caribbean to the Pacific coasts, through rainforest and cloudforest and down to the incredible Osa Peninsula and Corcovado National Park. You’ll travel by road, by boat and on foot as you explore the flora and fauna of this amazing country. Monkeys, toucans, macaws, red-eyed frogs and dolphins are just some of the species you might spot. Throughout the holiday you’ll be staying at comfortable lodges and hotels. This is a truly special wildlife and nature holiday in one of the world’s most biodiverse countries. Day 1: Arriving at San Jose airport you will be driven the 25 minutes to your hotel. The rest of the day is free for you to relax after your journey. Day 2: TO TORTUGUERO. This morning you’ll be driven towards the north Caribbean coast through the lush forest of Braulio Carrillo National Park. At Cano Blanco Dock you take a boat to Tortuguero National Park. You might see monkeys and birds on the way and you arrive at Evergreen Lodge in time for lunch. In the afternoon visit Tortuguero village to see local life and find out about the protection of the precious turtle nesting grounds near here. Day 3: TORTUGUERO. Tortuguero is best explored from its many waterways so you’ll join a guided boat excursion. There are over 400 species of birds here as well as three-toed sloths, capuchin monkeys and crocodiles, howler monkeys ... You can also take a kayak to visit lagoons and watch for bright green tree frogs and iguanas and other smaller creatures. Day 4: SARAPIQUI RAINFOREST. This morning you leave Tortuguero and head by water and road to Guapiles. After lunch you continue by road to Sarapiqui. It’s a lesser visited area but fascinating. Birdlife is prolific, with both lowland and highland species. This evening take a nocturnal guided tour to spot amphibians such as the show-stealing red-eyed tree frogs. Day 5: SARAPIQUI. You have an early start for a bird walk in the lodge's grounds this morning. After breakfast head to nearby Tirimbina Rainforest Centre for a chocolate tour! You walk through an old cacao plantation and learn about the history of chocolate production. Then you’ll be shown the current processing and perhaps sample the finished product for yourself! This afternoon is free. Perhaps explore forest trails, join a guided tour or boat cruise. (Pay locally for optional extras). Day 6: BAJOS DEL TORO CLOUDFOREST. Today you’ll be driven to Bajos del Toro Cloudforest. With its rich and varied plant life, waterfalls, streams and lagoons, it feels like an enchanted forest. Take a walk to see exotic orchids and colourful birds. Day 7: BAJOS DEL TORO. A morning guided birding walk might show you mainly highland species. Later you can explore several walking trails, each showing you different aspects of the cloudforest. There is also a stunning orchid garden. Day 8: MANUEL ANTONIO NATIONAL PARK. This morning you drive about 4 hours to Manuel Antonio, the smallest national park in the county. With a mix of beach and forest, a high density of animals and birds, and a network of well-marked trails, it is one of the most popular parks. Your hotel is at the edge of the park, and overlooks a sandy beach. Day 9-10: MANUEL ANTONIO. This morning you have a guided walking tour. In the varied habitats of beach, lagoon, mangrove and forest you might see monkeys, sloths, birds and iguanas. At the end of the tour you could choose to stay in the park to explore on your own. Later perhaps head for the beach. 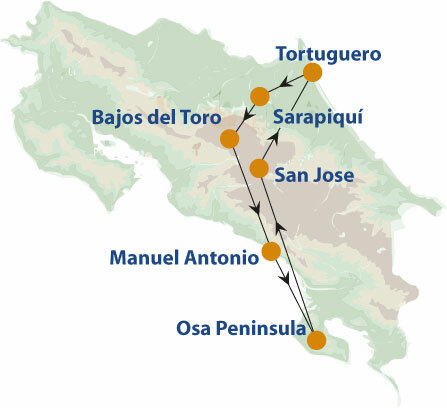 The following day is a free day for you to continue exploring Manuel Antonio. Day 11: OSA PENINSULA. This morning you take a boat travelling downstream to the coast and Drake Bay on the Osa Peninsula. You’re heading for Casa Corcovado Jungle Lodge where you can enjoy the lovely tropical gardens after your journey. Day 12: CORCOVADO. This morning you head into Corcovado National Park. A guided hike starts with an uphill climb through secondary rainforest. Watch out for monkeys, as all 4 of the species in Costa Rica are found here, and some of the region’s 400 species of birds including the largest number of scarlet macaws in the whole of Central America. At a viewpoint you might spot dolphins and whales. After a picnic lunch, return to the hotel. Day 13: CANO ISLAND, OFF OSA PENINSULA. This morning, take an hour’s boat trip to Cano Island. There's a beach for sunbathing and relaxing, but the main attractions are the coral reefs. The relatively shallow water has great visibility for snorkelling. Parrotfish, puffers, snappers, eels, barracudas, manta rays and turtles are all found here. Day 14: SAN JOSE. After breakfast we’ll drive you to the local airstrip to fly to San Jose. You'll be met on arrival and will be driven to Presidente Hotel. Day 15: Today you will be taken to the airport in time for you flight home. Costa Rica is known as one of the most environmentally-friendly countries in the world. They practically invented ecotourism, and over 25% of the country is a protected reserve. During this trip you will be visiting a good selection of these important reserves. The country runs a successful conservation initiative called the Certification for Sustainable Tourism (CST). This recognises services committed to preserving the environment and sustainability of the country. Costa Rica also has a Blue Flag programme. Selva Verde has 5 leaf (top) certification, and Bosque de Paz has 3 leaves. Evergreen Lodge is Rainforest Alliance certified. The gardens of Bosque de Paz at Bajos del Toro Cloudforest are a haven for wildlife and birdlife including large numbers of hummingbirds. There are 22kms of nature trails in the grounds letting you experience different aspects of the forest. There is also an orchid garden here, created in 2000 and showcasing over 200 species. Local guides are drives are used throughout this trip, and lodges which promote using local staff. We've weaved in visits to local villages on this trip. The visit to Tortuguero village for example, gives a good insight into local life and culture, and an understanding of how the villagers back the turtles protection projects. In San Jose and elsewhere, we always encourage and advise visitors to try local restaurants, and buy locally made products. The company offering trip works with partners on the ground in each destination, and only uses local guides. They also primarily promote locally-owned services (hotels etc). They are very clear which accommodations have good environmental and social responsibility credentials. This information is used to ensure that any traveller wanting to ensure they are really making a difference, can choose between one property and another on eco-issues. The also back a charity with funds and administration. This is a registered UK charity whose principle aim is to relieve the poverty of indigenous communities in areas outside of the UK which are affected by tourism. The charity backs poverty alleviation, education, cultural preservation and conservation projects within these regions. It has backed schools, clinics, micro-business projects and more. They are currently raising funds for 9 different grassroots projects in nine different counties, which travellers are encouraged to donate to if they would like to give something back.